Thanks for stopping by! 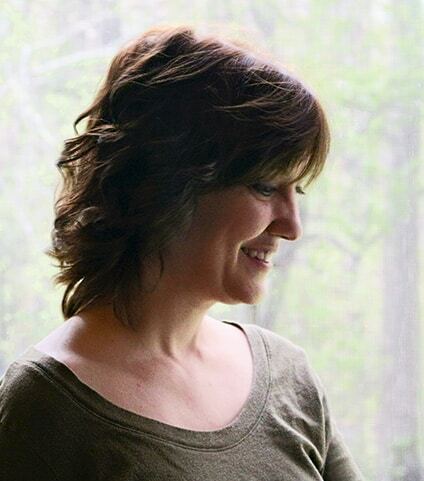 I’ve got a great recipe for you today and I’m excited about sharing it with you! 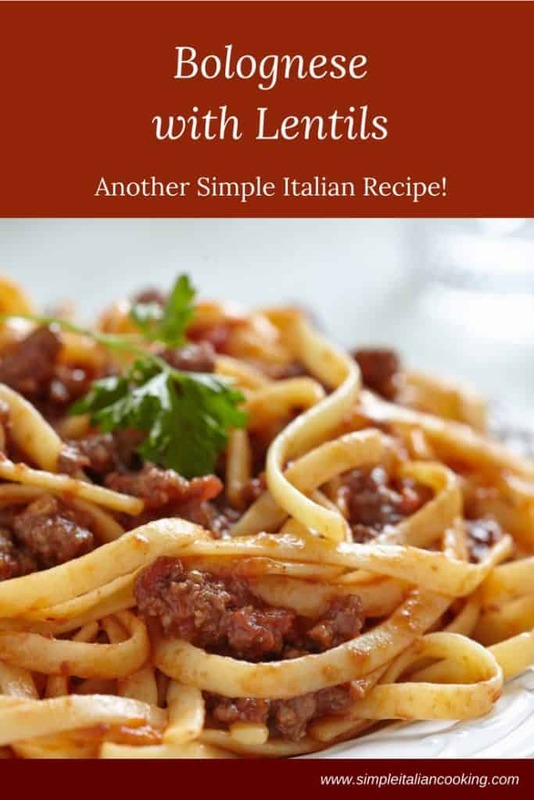 For this post, I chose to write about lentil bolognese for a few reasons. Well, I’d rather call it bolognese with lentils since I’m not using the lentils as a substitute for the meat. However, for starters, lentils are easy to cook, they don’t take a long time and as you start to learn more about the various types of lentils you start to realize how versatile they actually are. Lentils are of course very healthy. A great source of protein and fiber. Another motivator for this recipe. However, this recipe is not all lentils. I still use meat. So if you’re looking for a vegetarian recipe, you’ll have to make some big modifications. I do hope to do a full lentil bolognese but I need to experiment a bit more before I get it trustworthy! Check out my mushroom bolognese recipe for a vegetarian version – that’s real good too). Doesn’t a Bolognese Have Lots of Ingredients? Bolognese is actually a simple recipe. There are more ingredients used than I normally have in my recipes, but they are ingredients easy to remember b/c they are often used together. For example: celery, carrots, onions is a common cooking trio. That’s easy. Beef, veal, and pork. That’s easy. (I only use beef b/c well, I never think of buying veal). No olive oil means you use butter to fry the veggies which adds a great depth to the flavor. You’ll also notice this recipe is not loaded with tomato sauce! It calls for tomato paste and that’s about all. You can modify this recipe depending on what you have on hand, for example if you don’t have the red wine, omit it. Same with the broth, but then you get into really changing some of the robustness of the flavor in the original recipe. That’s okay. Do what you can. I do. Why am I adding Lentils in an Italian Recipe? Okay, yeah, yeah, yeah…. so what about an Italian recipe? I chose bolognese b/c a blognese sauce is already thick with chunks of vegetables and meat in it so the lentils will blend right in. I would use this with a spaghetti type pasta, (tagliatelle ideally) and definitely not a thin angel hair or vermicelli. No way, no how, don’t try it. But you could use it with a short pasta like penne if that’s what you have on hand, but again… stick to the tagliatelle if you can. Choosing to make Italian food health should NOT be hard. But for me it is. Bread, pasta and cheese aren’t exactly the best combo for a well balanced meal. So let’s work in some lentils just in the right dosage so it won’t overpower the flavor, change the texture, or make you a life-long enemy of lentils. For this recipe I use red (split) lentils. Red lentils are a different texture, they aren’t hard and they cook super fast and will become pretty mushy by the time this recipe is done. I’ve used lentils as a filler in meatloaf and it works out well. It also helps thicken up a soup if you ever are curious. If you don’t want to go that route with the red lentils, you can use green lentils. I would precook these and then add them in with the milk (yes milk). These will be more prominent and you actually might prefer the texture of them. I like either version. Adjust quantities to your own taste. Bolognese originates from Bologna in Italy. Just like Napoliatan pizza comes from Naples, this dish is named after the people of that region. There are many recipes out there and many have become so modified that I wouldn’t call them a true bolognese. Then again, who really knows? I haven’t done enough research and certainly my lentil version is far from a purists’ taste pallet. There is no olive oil in this recipe. 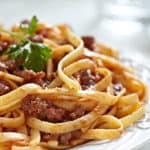 Bolognese is a thick sauce and has a buttery/creamy feel to it. Hence the use of milk and frying with the butter. This actually makes sense because Bologna is in the northern part of Italy where they use more cream based sauces. A healthier version of the popular bolognese pasta recipe. Dice the celery, onion, and carrot finely. Set aside. Add in the diced vegetables and fry at a high temp until browned. This helps remove excess liquid. Add in the meat and cook until thoroughly cooked. Add in the broth. Frankly, if you don't have the broth, don't worry about it. Add in the tomato paste and stir it in. Stir occasionally and cook for ideally an hour and half.